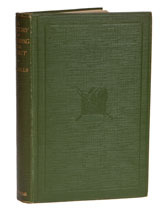 This is a classic and makes a very good starting point if you want to read about the history of fly fishing even now, nearly a century after it was written. Hills was an outstanding man in many respects, coming as he did from a family of high achievers and backed up by a childhood which gave him as much opportunity to fish as he could possibly have wanted. He was the MP for Durham City and then Ripon, with a brief interruption to serve as a Lieutenant-Colonel in the First World War, but was badly wounded and was invalided home. Hills wrote this book towards the end of his time as an MP and although it is overshadowed by his outstanding A Summer on the Test, it is still a thoroughly good read. Hills was tremendously engaging, if a little pedantic and these qualities shine out in the text, which suffers only from being written from such an Anglo-centric viewpoint as to almost completely dismiss any other nation's involvement in the development of fly fishing. This extends to Hills' decision that Aelian's account of fly fishing in Macedonia two millennia ago is an "aberration" and traps the author into an exercise in depicting fly fishing as a British invention, which, as we know, is untrue, but allowing for that, this book is a jewel and given the choice, I would read it in preference to Conrad Voss Bark's much later history, which adds little to Hills' account.